Come and visit our dogs! This beautiful girl recently came into our care. Roxy came to us after she was found as a stray in a remote northern community. Roxy is a female Shepherd cross with a birth-date of January 1,2019. Roxy is currently getting used to her new surroundings and is not yet available for adoption but should be soon! 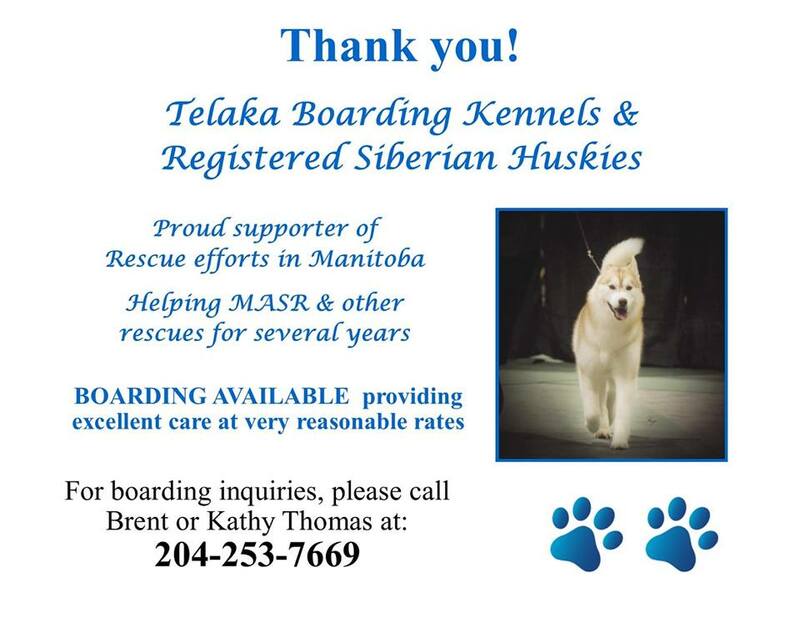 It has been brought to our attention that there are individuals collecting fraudulent donations on behalf of several rescue groups in Manitoba. These individuals are accepting cash or etransfers through their personal email accounts and the funds are never forwarded to the rescue they claim to be representing. 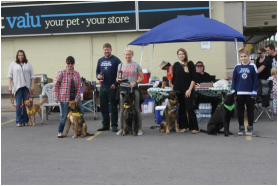 They are falsely identifying themselves as rescue volunteers and are committing fraud by targeting the generosity of those who support animal rescues. 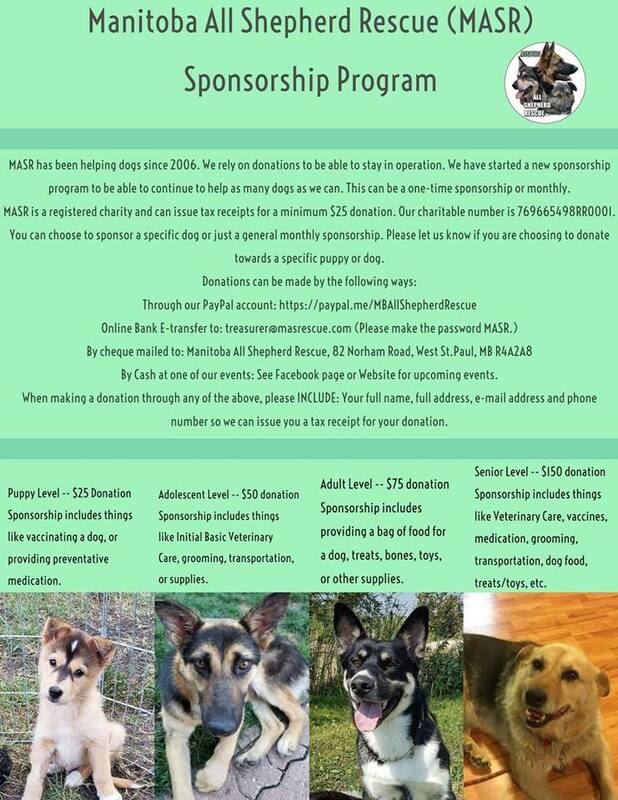 We also accept donations directly to our account at Plessis Veterinary Hospital. We never solicit donations by phone, email or go door to door. To confirm whether or not an individual is associated with MASR, please email us at the above address. If you believe you have been a victim of fraud, please contact Winnipeg Police Service to report it. In the spirit of thanksgiving weekend, we wanted to introduce our new sponsorship program. This sponsorship program is designed to help vet and feed all our puppies and dogs in care, as well as any unexpected costs. We are currently almost 100% out of food for our dogs. But to keep it simple for everyone, and keeping things easier on our dogs stomachs, we are now looking for monetary donations so we can purchase large quantities of food, and still be able to issue tax receipts to all those who donate $25 or more. There are 4 levels of sponsorship, and you can choose to donate as monthly sponsors or not. You can also choose if you want to be the sponsor for a certain dog or puppy. Costs of veterinary care (including medication) has been increasing, as well as the cost of quality dog food. One of our long term residents is now on a fully raw diet, plus natural supplements in order to help finally put an end to her allergies and boost her natural immunity. Her costs alone for maintenance is $150-$200. Please let us know if you have any additional questions about our sponsorship program. Please share this poster as well as we can really use the support to keep our rescue functioning and saving as many lives as we can! 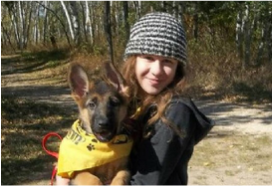 Manitoba All Shepherd Rescue has been uniting deserving dogs with wonderful families since 2006! 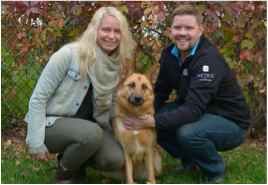 These are some photos of our adopted dogs with their forever families! Here are our cover photo collages celebrating the wonderful lives of our adopted dogs and pups! 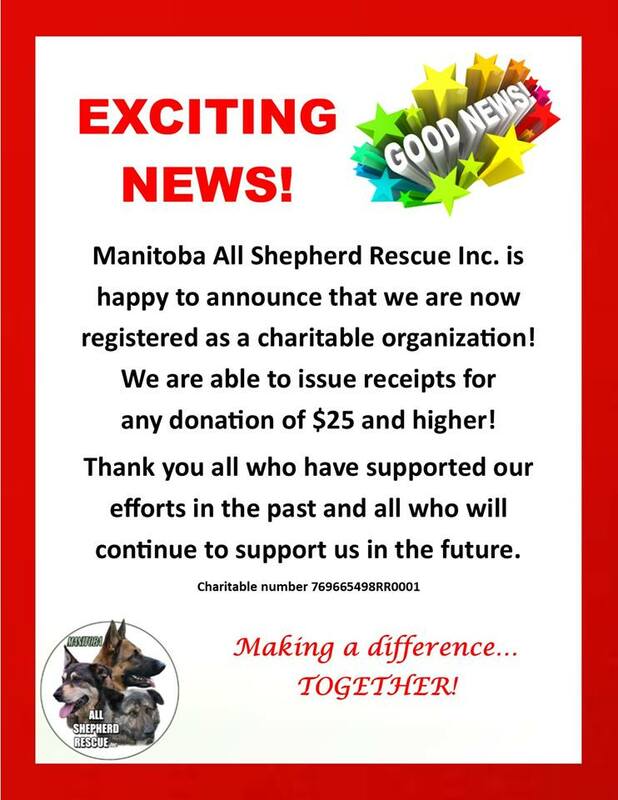 Watch Manitoba All Shepherd Rescue on Global! ​Have any of you following our rescue ever wondered why we do what we do? Ever thought that there's always so many dogs needing help and surely our efforts can't be making that much of a difference? Ever thought that you wouldn't want to foster because it may be too hard to let them go? Maybe figured that donating money or food is just a "drop in the bucket" because the need will always be there? Well, here's our answer to anyone asking those questions. This picture says it all! The top photo is Orion (now Diesel) who came into our care with his mom and three littermates from a very remote northern community. The bottom photo is Bair (now Bear) who came into our care after his owners moved and left him behind. Both of these photos show these beautiful dogs with their forever families. These two wonderful dogs, and hundreds of others just like them, have been helped by MASR because we had fosters willing to brave the heartache of letting them go on to their new lives. We were able to provide these dogs, and others, with the proper medical care because of the kindness of people donating towards their veterinary care. Good nutrition was also provided due to the generosity of people donating food. ﻿We are always looking for dedicated fosters to join our amazing team of volunteers! Have a look at our adoptable dogs and puppies and meet your future best friend! ﻿Learn more about how you can support MASR by volunteering or attending an event!